Blog | March 2017 | What Are Solar Panels Made Of? Whether it’s the food we consume, the beauty products we wear or the technology we use, consumers want to know what exactly these things are made of. We seek confidence that what we’re buying is safe for ourselves, our families and the environment. Solar shoppers are no different. For consumers and those in the building industry, the International Living Future Institute™ created a “nutrition label” for building materials including solar. Called the Declare Label, it’s a way for manufacturers to disclose the ingredients of their products and to explain the environmental impact. SunPower is the only global solar manufacturer to be accepted into the Declare Label program for its E- and X-Series DC panels. Now architects, designers, organizations and consumers can better understand how sustainably our panels are made. Declare also helps products qualify for the Living Building Challenge, a building certification program that defines the most advanced measures of sustainability by standardizing product labeling and promoting healthy materials. Each Declare product is screened against the Living Building Challenge Red List and entered into a public database where developers and consumers can easily search and select these vetted products. “Declare is the only label that provides Living Building Challenge project teams with all of the information we are required to obtain, not just on ingredients, but on manufacturing and end-of-life for relevant products. To say it simplifies the product selection process is an understatement,” said Lisa Carey Moore of Integrated Eco Strategy, a green building consulting firm. To be designated a fully certified Living Building, a building must be “net zero energy,” meaning it must generate as much power as it consumes. Using solar energy is a key way to accomplish this. “Given the net zero energy requirements of the Living Building Challenge, we are thrilled to have SunPower, a leader in the solar energy industry, join the Declare program. This will make it easier for our world leading projects to find the solar solution that they need while also meeting the highest standard of material health,” said James Connelly, Director of the Living Product Challenge at the International Living Future Institute. SunPower's green solar panels have helped many significant buildings nationwide earn the U.S. Green Building Council’s coveted LEED certification, which requires adherence to stringent sustainable building standards. Learn about several of those projects here, including the Bullitt Center in Seattle, a Living Building Challenge™ certified project. The Bullitt Center (pictured at top) is powered by a 244 kW rooftop array featuring 575 high-efficiency SunPower® solar panels. What Are SunPower Panels Made Of? 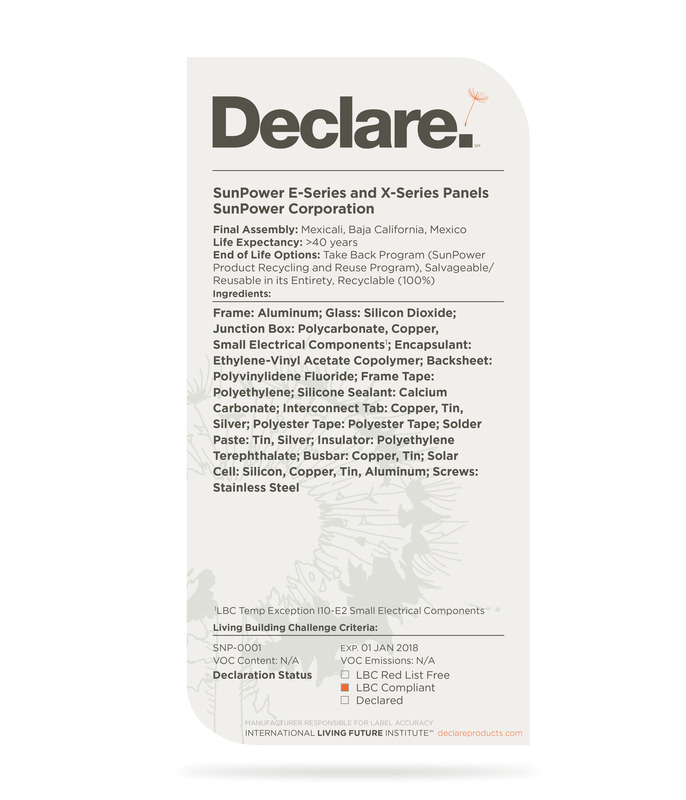 Just read our Declare Label pictured here to see what SunPower E-Series or X-Series panels are made of. Publishing a Declare Label is just one component of our Beneficial by Design philosophy, which aims to make SunPower a regenerative force on the environment and society. Every stage of our product lifecycle is driven by this closed-loop sustainability strategy, extending to our employees, consumers and communities around the world. If you're wondering: "Are solar panels toxic?" know that at SunPower we are committed to ensuring that our products and components are as responsibly made as possible. As a result, our E-Series and X-Series DC solar panels are free from harmful substances such as lead or cadmium and do not require hazardous waste handling procedures during the recycling process. SunPower also leverages our Supply Chain Sustainability Program to help our suppliers meet our environmental, health, safety, labor, ethics and chemical content requirements. Consumers and organizations require knowledge to make informed decisions about the products they use in their homes and offices. Beyond Declare Labels, one can also look at a product or company’s environmental certifications and awards. For example, SunPower E-Series and X-Series DC panels feature the Cradle to Cradle Certified™ Silver designation, which demonstrates a product’s quality based on rankings of material health, material reutilization, renewable energy use, water stewardship and social fairness. Through this certification, SunPower was recognized by Environmental Leader with a Product of the Year award in 2016. Also in 2016, SunPower received the solar industry’s top rating from the CDP (formerly the Carbon Disclosure Project), a global standard for emissions and energy reporting. When it comes to solar, there’s more to a product or company than price and power. There’s also the solar PV system’s effect on the environment. SunPower aims to be the world’s most sustainable solar company, and the Declare Label is an important step in providing consumers and organizations transparency into what our products are made of so they can make an informed decision. Look for more sustainability news coming soon from SunPower as we’re preparing to release our most recent Sustainability Report, detailing our company’s accomplishments toward meeting our sustainability goals. ©2017 SunPower Corporation. All Rights Reserved. SUNPOWER and the SUNPOWER logo are registered trademarks of SunPower Corporation in the U.S. and other countries as well. Cradle to Cradle Certified™ is a certification mark licensed by the Cradle to Cradle Products Innovation Institute. All other trademarks are the property of their respective owners.